Kevin Schopfer, heading up Ahearn Schopfer architects practice, has developed this unconventional solution to ecological living, specified for use in New Orleans. 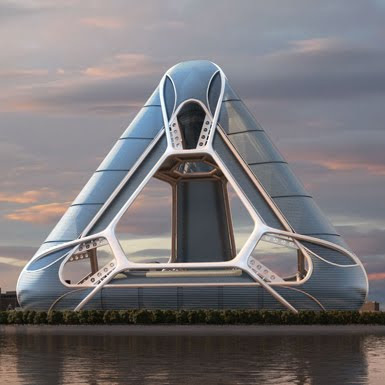 Together with Tangram 3DS, a firm specializing in visualization and computer animation, Schopfer has designed and presented New Orleans Arcology Habitat (NOAH) as a proposed urban Arcology (architecture and ecology), whose philosophic underpinnings rest in combining large scale sustainability with concentrated urban structures, in this case a floating city. NOAH's structure is designed for concentrated use with around 20,000 housing units at an average of 1,100 sq ft, three hotels, 1,500 time-share units and 500,000 sq ft of retail space. Also incorporated are three casinos, 500,000 sq ft of commercial condominiums, parking for 8,000 cars, a school, 100,000 sq ft of cultural facilities and a 20,000 sq ft health facility, making the structure socially self-sufficient. All fitting together with public amenities and administrative offices into an estimated 30 million sq ft. Asked about why NOAH took this form, the architect responded: "The Pyramid shape is the strongest, most able shape to guarantee structural stability when considering the size and height to width ratio of the entire structure. The shape was also chosen so that the wind and inclement weather would be able to blow through the building instead of fight it." Transportation through the structure would be made possible by the implementation of staggered 'zone elevators' and a mini electric 'subway' system. Chosen as the 'city that needs it most' the design of NOAH is not created to complement the fabric of New Orleans but as a 'sustainable icon' which would be forever anchored by its coastline.